The year 1997 found the members of the OCLC (Online Computer Library Center) cooperative in an expansive mood. More than 1,000 library leaders attended the OCLC President’s Luncheon in San Francisco, where they celebrated OCLC’s 30th anniversary. There were more than 25,000 libraries participating in the cooperative, including nearly 3,000 libraries in 62 countries outside the U.S., and the WorldCat database contained more than 37 million bibliographic records. Over the next ten years, the global digital library would indeed emerge, but in a form that few could have predicted. Against a backdrop of continuous technological change and the rapid growth of the Internet, the OCLC cooperative’s WorldCat database continued to grow and was a central theme of the past decade. As the chapters in this book show, OCLC’s chartered objectives of furthering access to the world’s information and reducing the rate of rising library costs continue to resonate among libraries and librarians, as the OCLC cooperative enters its fifth decade. This book was published as a special issue of the Journal of Library Administration. 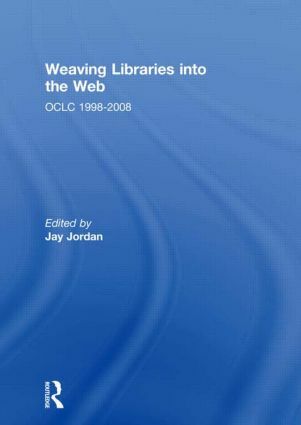 Jay Jordan became the fourth president in OCLC's 38-year history in May 1998. He came to OCLC after a 24-year career with Information Handling Services, an international publisher of databases, where he held a series of key positions in top management, including President of IHS Engineering. He is active in professional organizations, including the American Library Association and the Special Libraries Association. He is a Fellow of the Standards Engineering Society.